Egypt's President Abdel-Fattah El-Sisi said on Thursday that using water-preserving irrigation systems in agriculture is extremely important, stressing that "Egyptians must be careful with every drop of water they use." 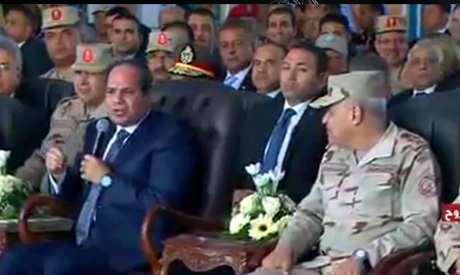 El-Sisi made the comments at Mohamed Naguib military base in Hammam city in Marsa Matrouh governorate, where he inaugurated the first phase of a project to build 100,000 greenhouses to grow agricultural products using less water for irrigation than used in traditional farming. The first phase of the project includes the construction of hundreds of greenhouses on 20,000 feddans in four different location nationwide, including the Hammam area, 10th of Ramadan City in Sharqiya governorate, Abu Sultan and Amal village in Ismailia governorate. The head of the National Company for Protected Agriculture General Mohamed Abdel-Hai said that 1,418 greenhouses will be built over 4,900 feddans in the Hammam area. During the inauguration, President El-Sisi stressed that water conservation is a responsibility that should be shouldered by both the state and the Egyptian people. El-Sisi said that the project aims to grow fresh, high-quality, pollutant-free produce and make the most efficient use of land and water, while providing new job opportunities. The president said that the greenhouse project employs civilians and does not aim to substitute for the role of the private sector, stressing that the greenhouses are available for rent to private businessmen. The president also said that the produce from the greenhouses will not be exported and will only be used to meet domestic demand.